The Couriers and Messengers Services Price Index (CMSPI) increased 1.2% in January, following a 0.3% decrease in December. The couriers component was up 1.2%, while the local messengers and local delivery component rose 1.3%. The price increases in January were mainly due to changes in base prices for both couriers and messengers as fuel surcharges decreased slightly. The CMSPI rose 3.5% in January compared with the same month last year. Both the couriers (+3.7%) and the local messengers and local delivery components (+2.2%) increased. 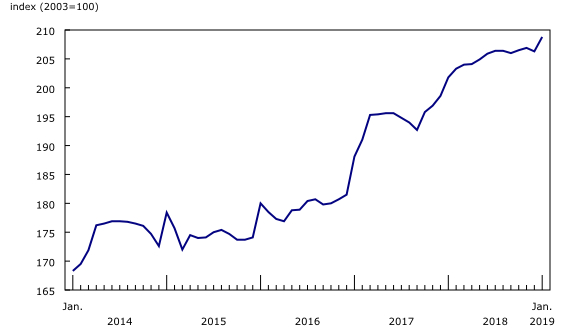 The Couriers and Messengers Services Price Index is a monthly index that measures the price changes for courier and messenger services provided by long- and short-distance delivery companies to Canadian-based business clients. With each release, data for the previous six months may have been revised. The index is not seasonally adjusted.